I know there are a quite some answers existing on this question. However, I found none of them really bringing it to the point. Some argue that a cycle is (almost) the same as a strongly connected components (s. Finding all cycles in a directed graph) , so one could use algorithms designed for that goal. Some argue that finding a cycle can be done via DFS and checking for back-edges (s. boost graph documentation on file dependencies). I now would like to have some suggestions on whether all cycles in a graph can be detected via DFS and checking for back-edges? http://www.me.utexas.edu/~bard/IP/Handouts/cycles.pdf (found here on S.O.) states one methode based on cycle bases. Me personally, I don't find it very intuitive so I'm looking for a different solution. EDIT: My initial opinion was apparently wrong. S. next answer by "Moron". Initial opinion: My opinion is that it indeed could work that way as DFS-VISIT (s. pseudocode of DFS) freshly enters each node that was not yet visited. In that sense, each vertex exhibits a potential start of a cycle. Additionally, as DFS visits each edge once, each edge leading to the starting point of a cycle is also covered. Thus, by using DFS and back-edge checking it should indeed be possible to detect all cycles in a graph. Note that, if cycles with different numbers of participant nodes exist (e.g. triangles, rectangles etc. ), additional work has to be done to discriminate the acutal "shape" of each cycle. Will a source-removal sort always return a maximal cycle? Perform a Depth-First Search on your graph. You are interested in recognizing back edges, i.e., in the traversal, an edge which points back to an ancestor (in the DFS tree, which is induced by edges of visiting nodes for the first time) of the visited node. For example, if the DFS stack has nodes [A->B->C->D] and while you explore D you find an edge D->B, that's a back edge. Each back edge defines a cycle. More importantly, the cycles induced by back-edges are a basic set of cycles of the graph. "A basic set of cycles": you can construct all cycles of the graph just by UNIONing and XORing cycles of the basic set. For example, consider the cycles [A1->A2->A3->A1] and [A2->B1->B2->B3->A2]. You can union them to the cycle: [A1->A2->B1->B2->B3->A2->A3->A1]. Maybe this can help you somehow, I found this site where a colored dfs for directed graph is described. So you can consider correct the dfs translation to php I present here. What I added is a part to create a forest and an other part to find all cycles. So please consider that it is not safe to take these two parts of my code as correct for sure. One with knowledge on graph theory might be able to test for sure. There are no comments in the dfs part because it is described already in the reference site. I suggest that you take an example with more than one tree and draw the forest (need 4 colors) in a paper to better understand. EDIT 2: I have to say that I have found that back_edge_exploit is insufficient it will only find cycles that are made with tree edges and one back edge. **** Edit 3: **** Although this solutions is found to be incomplete, it has some useful information, even the insufficiency it self is a piece of information, so I think it might be useful to keep it. But the main reason I have edited my answer is that I have found an other solution which I am going to present below. My implementation of Elementary Cycle Algorithm (that's the name) is in php and is as close to the original as possible . I have already checked it and it works. 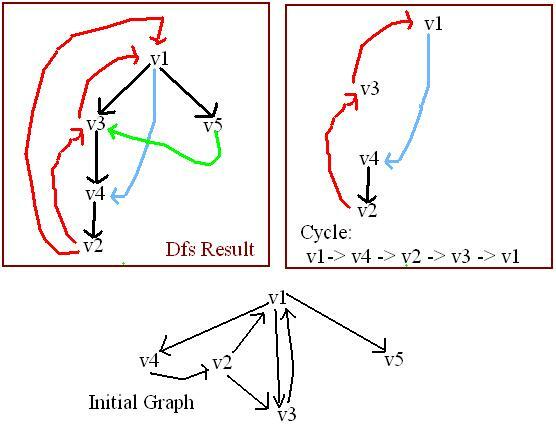 It is about directed graphs, if you declare you graph so that there is a directed cycle v1->v2->v3 and an other one v2->v3->v1 then both cycles will be found which is logical since it works on directed graphs. As for undirected graphs the author suggests other algorithms which make a better solution than modifying the algorithms, however it can be done by modifying the graph definition and by adding an extra check for cycles of length 2 which are considered as undirected edges. In particular an undirected cycle of three nodes would be defined twice in the definition, once per orientation, like this: v1->v2->v3 and v3->v2->v1. Then the algorithm will find it twice, once per orientation, then a modification of a single line on EC3_Circuit_Confirmation can cut the extra one. The nodes are defined sequentially, one can change the constant first and the adjacency list to make the first node count from zero or one. My suggestion is to use Tarjan's algorithm to find set of strongly connected components, and Hierholzer's algorithm to find all cycles in the strongly connected component. If a traversal algorithm visits each edge only once, then it cannot find all cycles. An edge could be part of multiple cycles. btw, what is a back-edge? Also, perhaps you should rephrase/format your question. It is very hard to read.